#acwri chats will return on Thursday, January 22 at 8:00 BT (3:00 ET)! H ost Pat Thomson will moderate a discussion on the challenges of setting and meeting academic writing goals. Everyone is welcome to join in with their questions and insights about productivity in academic writing. At this time of year, many writers are trying new approaches and making new resolutions; in this chat, we will consider why those resolutions are so hard to keep. Are we setting unrealistic goals? Are we saying “yes” to too many non-writing activities? Are we trying to find time to write without giving up anything else? Are we sticking with writing approaches that haven’t worked well for us in the past? Are we getting discouraged by the lack of immediate results? Are we assessing our own writing too harshly? One thing that we know often hampers attempts to develop new habits is trying to do it alone. While writing is often a solitary task, we can still gain solace from a community of other writers. The #acwri chats are a way of building that community and creating a space for writers to share their experiences with all facets of academic writing. Please join us on January 22 to be part of this valuable forum. In addition to questions and comments about goal setting, we welcome suggestions for topics for future chats. To learn more about the history of the #acwri hashtag, read this post from Anna Tarrant. And to learn more about the #AcWriMo hashtag, read this post from Charlotte Frost. The #acwri live chat this week focused on the value of Twitter for supporting academic writing. Some of the key Tweets from the discussion can be viewed below but the following briefly summarises the discussions. Perhaps unsurprisingly, there was a lot of support for using Twitter to help with academic writing. 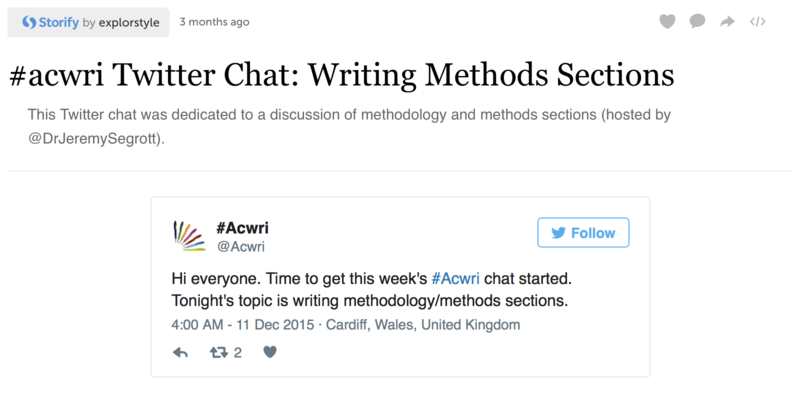 Those who took part in the chat are established Twitter users and already use the #acwri hashtag to discuss writing. However the reasons why Twitter is considered useful were more varied and may even persuade the novice Twitter user to give it a try. People like that it can be used to link to informative resources (such as blogs), that it challenges them to write concisely and to break down key messages. They also like that it is accessible and facilitates a network of individuals from diverse backgrounds, all who share an interest in academic writing. They also think that it helps to improve their other forms of academic writing. There was also a critical discussion about the value of Twitter for academic writing. Some discussed lacking confidence in Tweeting opinions and points and felt that being accountable was important. Others discussed the challenges of negotiating and presenting identity through Tweeting. It was felt that disagreeing with people’s points was more difficult. It is much easier to agree with others through this medium, possibly limiting debate. Finally, not included here, was a discussion about how the use of social media continues to be blamed for the poor writing styles and writing abilities of students. A summary of this discussion will be posted soon. 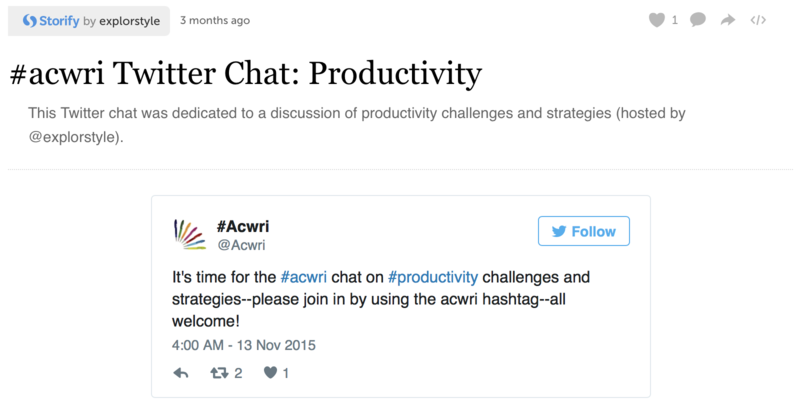 This week the #Acwri live chat was all about using Twitter for Academic Writing. This chat was well attended and lively and encouraged a lot of discussion. A written summary of the chat can be read in todays post but if you would like to read the chat in full, which includes the key Tweets from the discussion, you can view them on Storify. The conversation started with some reflection on why academics are using Twitter. Responses ranged from finding relevant communities of practice, keeping in touch with people efficiently and quickly, keeping networks alive, reaching a bigger audience, making connections across space and between groups, to be social, to find out about things and stay up to date, to share #acwri outputs, and to be at the intersection of multi-disciplinary conversations relevant to individual work. These responses indicate the diversity of reasons for using Twitter as an academic. Others also consider it good for practicing concise writing (in only 140 characters), setting goals and asking questions. One user even argued that they use Twitter as a way of keeping notes (@strictlykaren). This led to some discussion about using Twitter to link to other content, such as blogs, where discussion can continue elsewhere. A significant thread of conversation in the early stages of the chat was that many enjoy live Tweeting from conferences, but also have some concerns about it. People question when it is appropriate to do it and how often, during a talk for fear of taking over Twitter feeds. Challenges with Twitter writing were also explored. Errors in spelling and grammar were commonly discussed. One Tweeter felt that tweets were less coherent and bitty, rather than an argument (@spani3l). Some did not like when people swear and rant, and others dislike when individuals write lots of Tweets one after the other. @helen_kara responded to this well saying “Don’t drink (much) & Tweet”. This led to a conversation about how Twitter is used. Many use it semi-professionally or professionally. Consequently developing an academic identity on Twitter is important. Many are aware of the public nature of Twitter content and therefore the need for appropriate conduct. There was a difference in opinion about using Twitter only for professional discussion and sometimes for including more casual talk. An interesting distinction was made between the use of Twitter for work and Facebook for personal interaction. The conversation ended with some discussion of the use of G+ (Google Plus) rather than Twitter for academic writing and communication. Conversation was described as much more natural and substantial on G+, despite the fact that less academics are currently using it than Twitter. There is some resistance to being on another social network but @spani3l likes the fact that it can be used for multiple tasks such as video conferencing and having more sustained conversations. 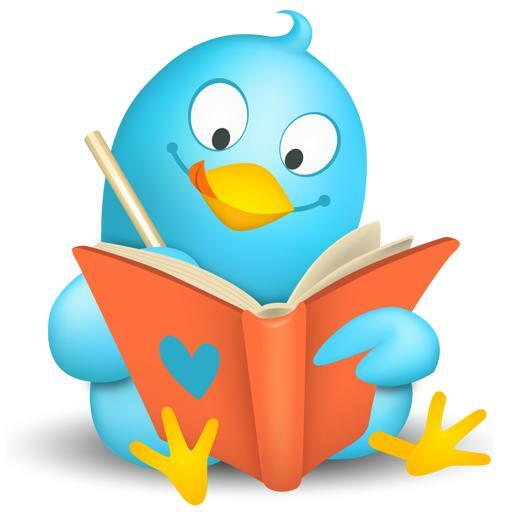 What are your opinions on using Twitter for academic writing? Does anyone have any experience of G+? Do you have a Twitter account? Are you interested in all things academic writing? Have you got any questions or concerns about your academic writing that you want some advice about? If any, or all of these questions apply to you why not take a look at the #acwri hashtag on Twitter? Making great use of the tag is a burgeoning community of writers all discussing their writing goals and ambitions, trails and tribulations. You can get great advice from individuals at all career stages about academic writing and really benefit from sharing your own experiences. To find out more about the #acwri initiative take a look at our Live Chat page. As part of #acwri we also run a fortnightly live chat and the next one is taking place on Twitter this Thursday, 20th September, at 8pm UK time. Please do come along and take part. We like to ensure that the #acwri community has some say in what we discuss and you can now vote for your preferred topic in the Tweet Poll below. The topic that receives the most votes will be the one we discuss on Thursday. If you can’t make it to the chat don’t despair! We also write a summary of each chat that is posted to this site so you can still benefit from the collective learning. You can check out previous chats now in the Live Chat tab Archive. Hope to see/meet you soon!